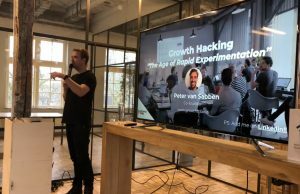 Peter van Sabben- Co-founder Growth Tribe, explains the importance of Growth Hacking in today´s business marketing strategies. Furthermore, in both the digital world and non-digital world, the need to measure everything means that for professionals everything becomes data driven. According to van Sabben, in many tech companies, the profile of Chief Marketing Officer (CMO) not only includes experience in marketing or branding but also in data analysis or economics because it is a profile which contains better analytical skills. 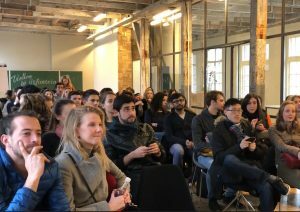 For the International Master’s students, finding out about the profile of a growth hacker was of particular interest. Growth hackers usually work in small technical teams with a mix of profiles. Their focus varies depending on the performance of the data but the teams’ main objective is always the rapid growth of the business. There is an increasing demand for growth hacking by both startups and big companies which are using it to train up their teams. The need to adapt to this fast-paced digital world is forcing companies to make rapid changes. This is where growth hacking makes the most of agile working methodologies where small teams of up to eight people with different profiles (Sales, Marketing, Finance, Communication etc.) work on short-term projects. When the project is finished, the teams move on to a new one.